Happy Wednesday, and welcome to another awesome installment of Albert the Alien! To everyone we met at C2E2 and who discovered this comic: welcome! To everyone returning to enjoy the comic: welcome back! 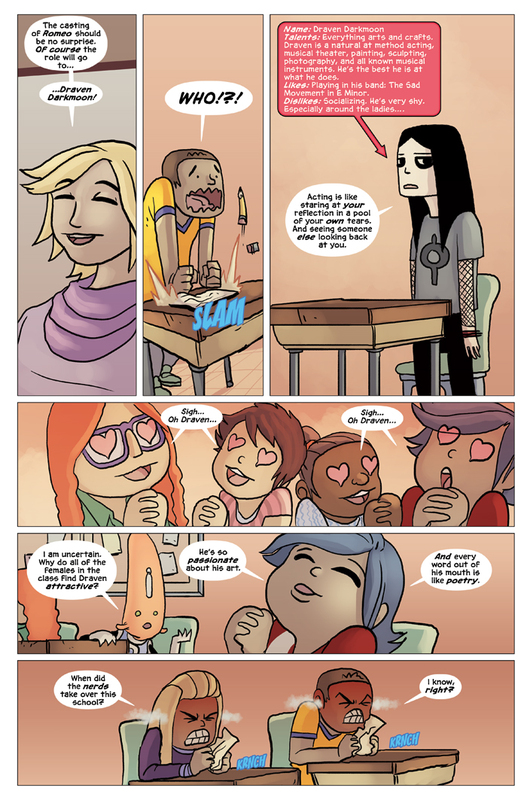 In today’s issue, we’re introduced to a (new to us) student in Albert’s class, Draven Darkmoon. Draven is an artistic kid, good at acting, painting, music, etc. He’s kind of the Edward Cullen of the school, with all the girls having some strange and unexplainable attraction to him. Unlike Edward Cullen, Draven is totally awesome. He’s been cast in the leading role, which doesn’t make Flip or Patricia too happy. Both of them lost out on being cast in the leading roles for this play, leading to the final panel of this page – which is my favorite panel in the story so far! Plenty more coming on Friday, and next week – WE LAUNCH OUR KICKSTARTER CAMPAIGN! Next week we’ll be at our next convention appearance: Anime Central! ACEN is the 3rd largest animation convention in the country, takes place in Rosemont, Il on May 16-18, and is my absolute favorite show of the year. Gabe will be in Artist Alley, and I will be a returning guest of the show! I’ll have a number of panels throughout the week (my panel schedule will be posted closer to the event date), as well as a number of books for sale. And commissions – did I mention Gabe and I will both be doing commissions?